Ron is a Nurse Practitioner and specializes in family health issues. He began practicing in 1997 as a Registered Nurse and has worked in acute care, emergency medicine, and air medical positions. He completed his Nurse Practitioner degree from the University of Kansas in 2012. He began working for the Rooks County Health Center in 2012 at the Doctors Without Delay Clinic. 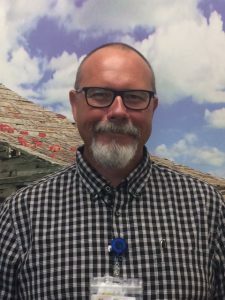 In the summer of 2017 he received the opportunity to move into a primary care role at the Rooks County Health Center Clinic and is very grateful for this opportunity to serve Rooks County in this new role. He and his wife Tammie currently live in Hays and have 8 children and 11 grandchildren. They enjoy motorcycling, traveling, and spending time outdoors. What is a nurse practitioner (APRN)? A nurse practitioner (NP) is a registered nurse (RN) who has completed advanced education and training in the diagnosis and management of common medical conditions, including chronic illnesses. Nurse practitioners provide a broad range of health care services. They provide some of the same care provided by physicians and maintain close working relationships with physicians. A nurse practitioner can serve as a patient’s regular health care provider.